2003 ? Starting all over. Long Term Conclusion - After 5 years of results and data to analyze, it is obvious that our plot has been less than ideal. I attribute this to two factors. 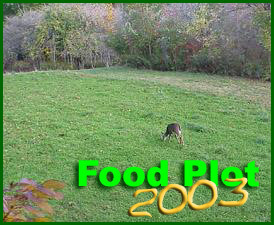 The first and most important is that the plot size is simply too small for the amount of deer in this area. 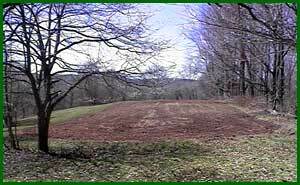 At 1 acre the seed is unable to establish itself sufficiently to withstand heaving deer grazing. This was illustrated by our pea planting in 2002. When we checked on the plot, all that was left was stems. The second factor is weed and grass intrusion. Because the plot is small, and it is surrounded by areas of noxious weeds, it has been virtually impossible to control weed and grass growth. The prolific and aggressive weeds quickly overtake our young target crop and choke it out. This may be controlled through herbicide, planting, and regular mowing. Since this is a remote plot and visiting it often is impossible, the plot is having a difficult time competing with the weeds. New Strategy - Unless we take drastic measures of clearing more land, we are dropping the Imperial Whitetail perennial and are switching to the No-Plow seed along with a planting of common Red Clover. 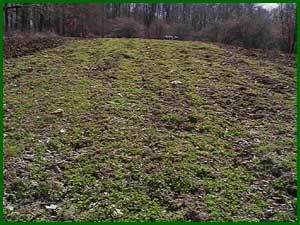 The thought here is that the Imperial No-Plow will establish quickly and give the Red Clover more time to establish. 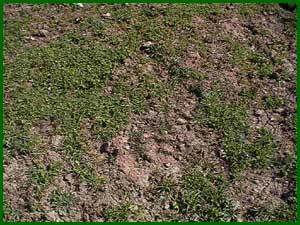 Once the red is established it is hardier, faster to regenerate than white clover. 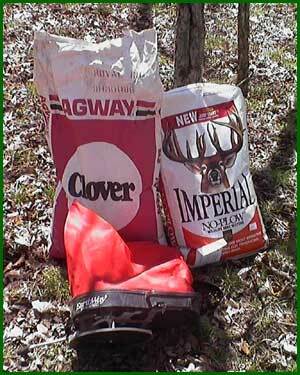 We realize that deer prefer the white clover but given the size of our plot, it is difficult to establish. This is what our plot looked like on May 1st. 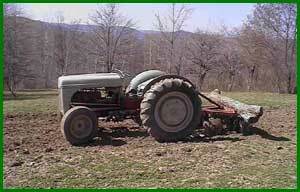 We used our Ford 9N tractor and a small disker to loosen the soil and break what little vegetation was left. 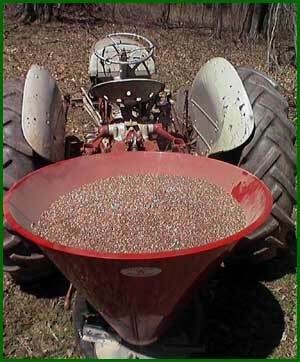 We spread 1000 lbs of pelletized lime, and 200 lbs of 10-20-20 fertilizer on our plot. This was in accordance with the results of a prior soil test. 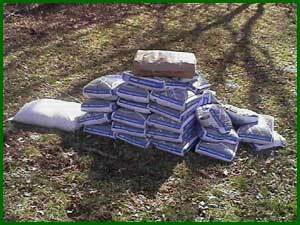 The fertilizer was spread over the plot at a low rate of broadcast. This allowed us to make 3 complete passes over the plot to ensure the most consistent coverage. We used Royal Red Clover and Imperial No-Plow as our crop choice for '03. This was mixed, and broadcast by our hand spreader. We'd like to hear from you - Discuss our conclusions, 2003 choices, and perhaps other recommendations?